We have noticed that you have skills to teach to others that may improve their game in the SCA! Please consider coming to the Shire of Riversedge on Saturday, November 14, 2015, for the Fall Æthelmearc Æcademy. The event will be held at the French Creek Valley Campus (420 North Street, Saegertown PA 16433); we will welcome everyone starting at 9 am. Doors will close at 7 pm. The campus is laid all one level and we welcome those that need assistance to attend. Living in History is the focus of Fall Æcademy. Looking to take your persona to the next level? Then this academy is for YOU! Some examples of classes we are hoping to see include mending, cooking (with an outdoor fire ready and waiting including a bread oven for classes), fiber arts, blacksmithing, pottery, wood working, bee keeping, animal husbandry, food preservation, medicinals, dyeing, ink making, C&I, knot tying, basketry, hound coursing, customs and manners, grooming, games, costuming, leather working and so much more! 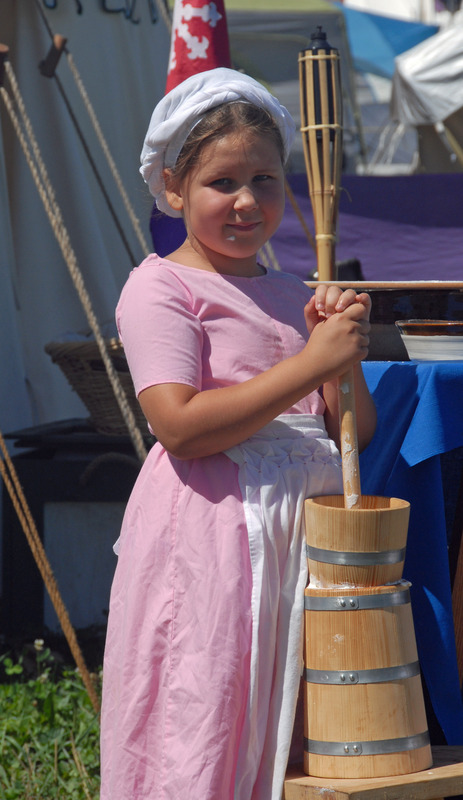 Elizabeth, daughter of Duchess Ilish, teaches butter churning. This year’s Æcademy will be filled with exciting new additions including a track of classes taught by and for our Kingdom’s youth artisans! Duchess Ilish had the idea for a track of classes for youth, and the Æcademy staff enthusiastically agreed. She is looking for hands on, make and take, or simple beginner classes. The Youth Track will welcome not just arts and sciences but youth fighting and fencing classes as well. Some ideas for classes include cooking, C&I, sewing, period dancing, games, animal husbandry, and weaving. To help foster families participate in the event, children 17 and under are admitted free into the event but encouraged to pre-register for food planning purposes. For more information about the Youth Track, to recommend a youth instructor, or if you wish to teach a youth track class, please contact Duchess Ilish O’Donovan by email. It is everyone’s hope that the Youth Track will become an ongoing part of future Æcademies. Those of you who wish to teach with the War College have ample outdoor space for fighting, fencing, thrown weapons, youth fighting and fencing. If the weather is inclement, fencing and youth fighting can be held indoors in the gym. We have something special lined up for the heavy weapons community, too! A Golden Chain day of learning and Tourney will be coordinated by Duke Duncan von Halstern and Syr Stefan Ulfkelsson. Classes taught by members of the Order of Chivalry will help you hone your skills, and a Golden Chain Tourney will let you put those skills to the test. What else do we have for you? The shire will also host a sideboard lunch filling your plates with meats, soups and breads of the harvest season, created by our very own Lord Calean O’Rurik and his wonderful staff. Lunch sideboard will be included with the site fee we do ask to please send in your reservations in advance to so the kitchen make sure there is an abundance for everyone. General teaching and classroom questions should be directed to Mistress Marsi of Hadley by email. Or just register to teach at www.aecademy.net/registration. If cost is a concern, do not delay, for the cost of this event is just $10 for those 18 and older; attendees 17 and under are our guests and pay no fee (other than the NMS, if applicable). See the full event announcement at www.aecademy.net or http://www.shireofriversedge.com/shireevents.htm.